Sambo's Clubhouse is designed for kids between 2 to 6 years of age. Simply purchase a coupon book and come any day of the week to explore new things, be creative, learn and have fun. Cost: $6/day, $60 for a coupon book for 10 sessions or $100 per month. Kids can be dropped off or accompanied. While class starts at 3 p.m. Drop off is from 2 pm onward. Pick up time is at 4:45pm-5:00pm. The main theme of the program changes every day. We also provide a healthy snack for each child. *Please note that sub-themes may vary. Arts & Crafts: Using different materials and techniques to create innovative craft and arts, to promote fine motor and creative skills. Clay Play: Learn how to make bowls, cups and little figures like elephants, snowman, or jewelry. While we mostly use local clay we also explore other textures to create various forms and shapes and sometimes make our own clay. 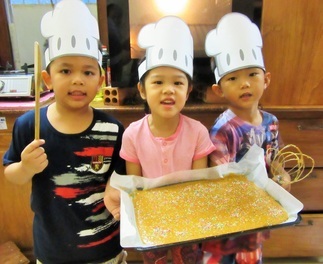 Cooking: In this joyful class children prepare delicious and healthy snacks, salads, cookies and more. This is a perfect class to introduce kids to new foods and learn how to prepare scrumptious recipes that are fun and healthy. Each recipe encourages exploration, discovery, creativity, and following instructions. Science: Have you even wondered how flowers grow or how to make a small rocket. In this class we explore nature and science to help the children to gain a better understanding of their natural surroundings. This class is designed for kids who like to experiment around the house. Dancing, Yoga and Soccer: This class is designed for kids who love to move! Express yourself, feel the beat and let the rhythm take you to new discoveries. This energetic class combines elements of mime, movement and dance to get everyone moving to the beat! Explore different dance and movement styles from Apsara to Disco through a wide-range of fun music. Also to relax and learn to stretch, tone and relax their minds. We also have experts from Elite Soccer giving a fantastic football lesson to the children.